For quick answers, use technology. The online calculators and spreadsheet tips below make quick work of the calculations. To understand the details, do at least some portion of the math yourself. You’ll make more informed decisions when you understand the numbers. Types of interest: To get the correct information, you need to understand exactly how interest is charged, and that depends on the loan in question and the lender’s rules. For example, credit cards often charge interest daily—so it pays to make payment as soon as possible. Other lenders might calculate interest monthly or annually. This detail is important because you need to use the right numbers for your calculations. Lenders typically quote interest rates as an annual percentage rate (APR). 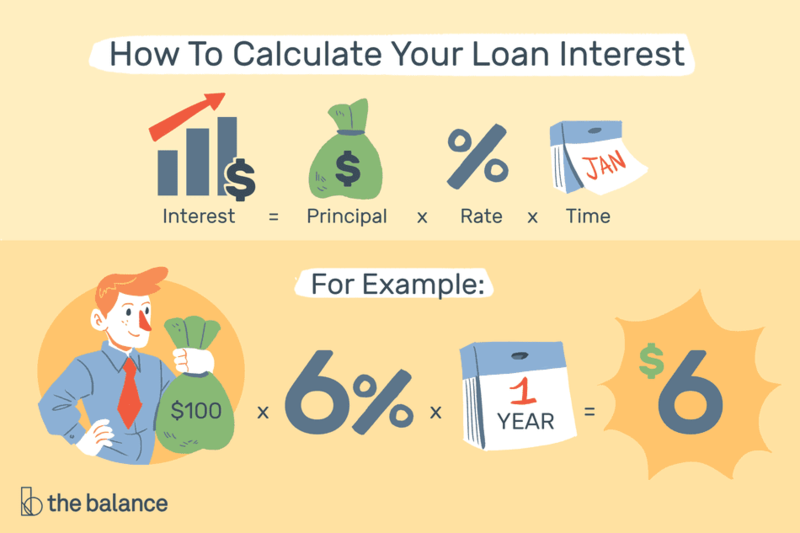 But if you pay interest monthly, you’ll need to convert that rate to a monthly rate by dividing by 12 for your calculations (for example, a 12% annual rate becomes a 1% monthly rate). Spreadsheets like Microsoft Excel, Google Sheets, and others make it easy to build a model of your loan. See exactly how to calculate with a spreadsheet (with easy-to-follow steps and free templates). With a basic model, you can change inputs to see how different loans compare, and you can view total lifetime interest costs. A loan amortization calculator ​does everything for you. It will calculate your monthly payment, show how much interest is in each payment, and show how much you pay down your balance every month. Copy and paste the output into a spreadsheet if you want to do more analysis. Don’t want to use a spreadsheet or calculator? You can do it all by hand—or at least build a spreadsheet by hand. You’ll become a pro at understanding interest expenses. Simple interest example: Assume you borrow $100 at 6 percent for one year. How much interest will you pay? Most loans aren't that simple. You repay over many years, and interest is charged every year, sometimes even compounding and causing your balance to grow. Real-life example: Assume you borrow $100,000 at 6 percent APR to be repaid monthly over 30 years. How much interest will you pay? Assume this is a standard installment loan, like a home loan. Hint: The monthly payment is 599.55. You’ll actually pay a different amount of interest every month—ideally, the amount decreases each month. These loans go through a process called amortization, which reduces your loan balance over time. Calculate the monthly payment. For tips, see How to Calculate Loan Payments. Convert the annual rate to a monthly rate by dividing by 12 (6 percent annually divided by 12 months results in a 0.5 percent monthly rate). Figure the monthly interest by multiplying the monthly rate by the loan balance at the start of the month (0.5 percent times $100,000 equals $500 for the first month). Subtract the interest costs from the monthly payment. Keep a running tally in an additional column if you want to track interest over time. Apply the remainder of the monthly payment to principal repayment. This is how you reduce your loan balance: Through principal payment. Calculate your remaining loan balance. Copy the remaining loan balance to the beginning of the next line. Repeat steps two through eight until the loan is paid off. You’ll see that a portion of each payment goes towards interest expenses, while the rest pays down the loan balance. Payments in the early years primarily cover your interest costs, and this is especially true for long-term loans. Over time, the interest portion decreases, and you pay down the loan more quickly. With credit cards, the calculation is similar, but it can be more complicated. Your card issuer may use one of several different methods to calculate interest charges and minimum payments. These methods account for purchases and payments that occur throughout the month, as well as the card issuer’s approach to generating profits. For a detailed example of how to calculate interest, payments, and debt payoff with a credit card, see Calculate Credit Card Payments & Costs. If you want to calculate a loan’s interest rate—as opposed to interest costs—see How to Calculate Interest Rates. Interest effectively raises the price of the things you buy, whether it's a new home, a car, or equipment for your business. In some cases, those interest costs are tax deductible—which is one more reason not to ignore them. In other cases, interest is simply the price you pay for using somebody else's money. To understand your finances, it’s wise to calculate interest costs any time you borrow. This allows you compare the costs of different loans, and it’ll even help you evaluate big decisions such as how much to spend on a house or automobile. You can compare lenders, choose between longer or shorter loan terms, and find out how much the interest rate really affects your total interest costs. What Is a Loan Prepayment Penalty?